ERAI is a long-standing, industry-recognized international organization that provides critical insight to any organization seeking to prevent nonconforming and counterfeits from entering its supply chain. ERAI should be considered a credible source for obtaining counterfeit, suspect counterfeit and fraudulent part information and a tool for screening against known high risk parts in the market. Reporting is simple and free of charge for any company involved in the purchase, sale or use of electronic components. 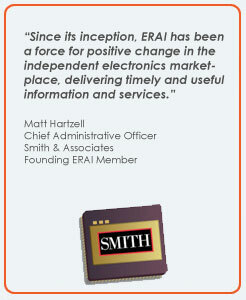 You do not need to be a Member to share information on nonconforming or suspect counterfeit parts with ERAI. ERAI's reporting process provides complete anonymity to the reporting company or entity and information about the reporting company or entity is not visible on the ERAI website. Report counterfeit electronic parts, suspect electronic parts and nonconforming electronic parts by clicking here.